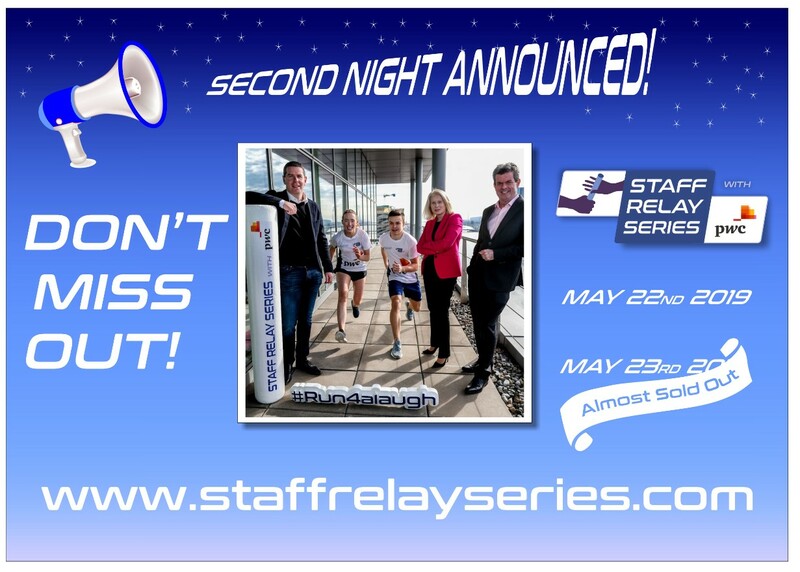 The Staff Relay Series with PwC, Ireland’s biggest staff night out is back. Taking place in the Phoenix Park on Wednesday 22nd & Thursday 23rd May (SOLD OUT), 2019 at 18:00. Don’t miss out on your chance to be part of this great event. If you are tired of the same old staff night out in the pub then why not join us for a fun filled healthy alternative guaranteed to offer camaraderie, teamwork and vigorous entertainment. Ireland’s favourite corporate relay event is a salubrious affair where for one night only nurses take on doctors, bankers line up beside brokers and firemen rival gardai as they each toughen it out to be the first team home. The final kilometre of each relay leg is run through the notorious Relay Village where team mates are gathered by the sidelines, cheering you home, offering some final encouragement or perhaps attempting to distract so a rival team can pip you at the finish. Click on the register here link to book your team’s place in the Staff Relay Series with PwC 2019 and join in the night of fun, fitness and friendship. Like the sound of it! Then Register your team today.